Thinking of giving your interiors a major overhaul? Hiring an interior designer is definitely the way to go for creating a fabulous and functional home. Unfortunately, not all homeowners could afford the services of one. That’s okay, we’re here to help! 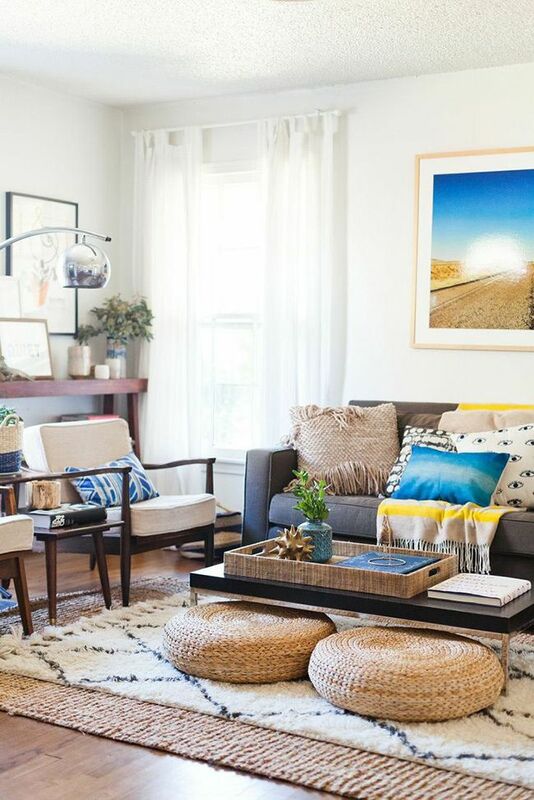 Today we are outlining some of the best small apartment ideas and decorating tips straight from the pros! For a home that looks professionally done, you need to look for design inspirations. Reading home style magazines, checking out online looks, and creating your own Pinterest board are great ways to plan your interiors and get the creative juices flowing. You can go online to download different home styles or cut out pictures that struck your fancy. After collecting all the style inspirations that caught your eye, step back, review your work and you should have an idea what type of look you’re looking for. One of the key elements of a well-designed home is color coordination. Since color preference is such a personal thing, you’ll have to check your inspiration board to see what shades you’re most drawn to. Ideally, you have to choose three complementing shades to build your interior style on. The first color goes for the walls. This shade will dominate the room. The second color is for the large furnishings, such as the sofa, chairs, draperies, rugs, etc. The final color goes for the smaller decors to lend a delightful pop of color, such as pillowcases, houseplants, etc. Whatever base color you chose, always remember that your preferred shade could affect the brightness of a room. Adding texture to the interior design gives the room depth and character. This goes especially for all-white or all-grey rooms, texture helps break the monotony of a room done in one color. We’ve already outlined ways to introduce texture to a space but if you need more help, start by incorporating houseplants, plush pillows, woven baskets, eye-catching artworks into your interiors. Decors and pieces of furniture made from natural materials, such as cotton or wood, add texture to an otherwise bland, flat room. You can also mix and match different textiles to create an interesting focal point in the room. Adding a vase of flowers to different rooms is a terrific way to incorporate color and texture into your living space. Don’t be afraid to experiment with different textures to create a unique design that reflects your eclectic style. 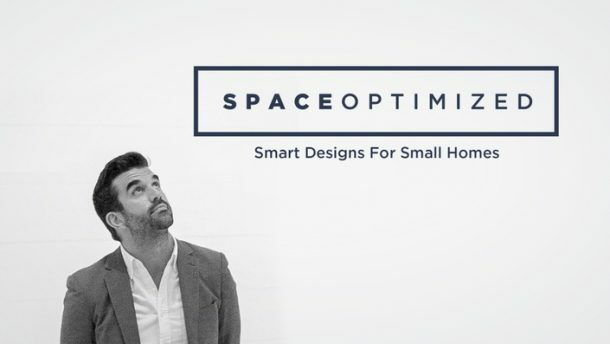 When decorating a small room, you have to reduce, if not eliminate, horizontal lines and focus on strong verticals. A room filled with too-tall pieces of furniture will only confuse the eyes and make the room look messier. 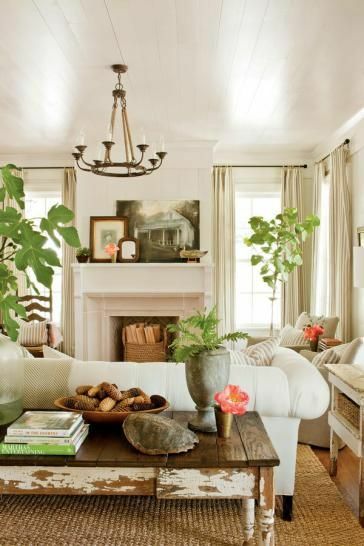 To keep the interior design balanced yet easygoing, use low-slung pieces or skirted furniture. 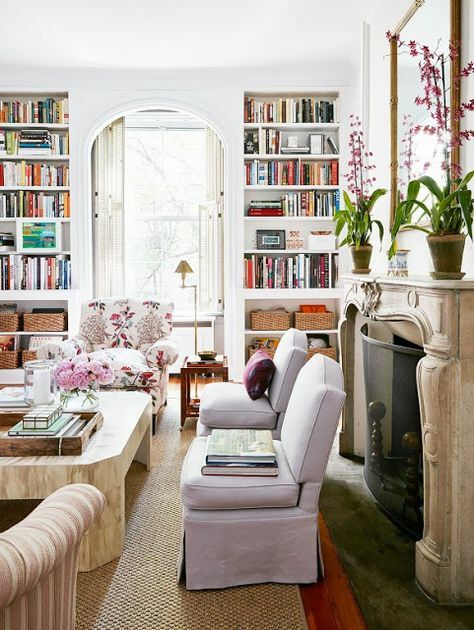 Try mixing and matching different furniture styles and sizes to create a harmonious and cozy living space. Bring all the design elements together by adding a sizable statement piece, perhaps an eye-catching cabinet or an accent chair. Metallic accents are quite trendy and will suit most color schemes. 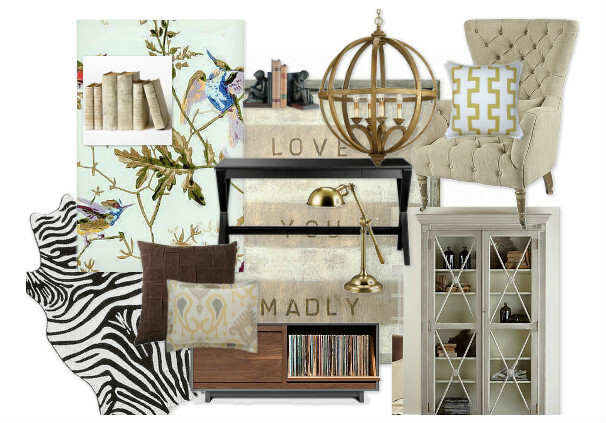 I highly recommend mixing silver and gold accents to add plenty of sparkle to the room. 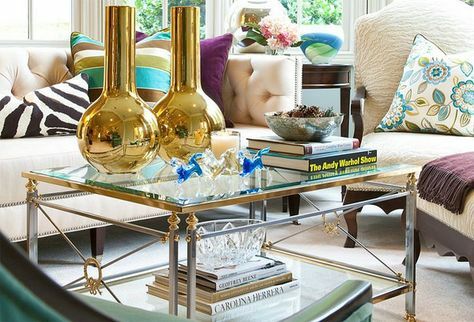 You can use baskets, metallic decorative vases, eye-catching bowls, and catch-alls to create a layered, decorated space. Want to make your own shiny centerpiece? Try using a mirrored or metallic tray. Add a couple of scented candles, a kitschy decor, and a vase of blooms. Set your centerpiece on a coffee table or side table and voila, your pretty piece of displayed art is complete! One of the best small apartment ideas for giving a room a cozy, lived-in appearance is to accentuate key areas of the space with decors or loose items. Decorate your living room with grouped decors in varying sizes to keep the space from feeling too flat. 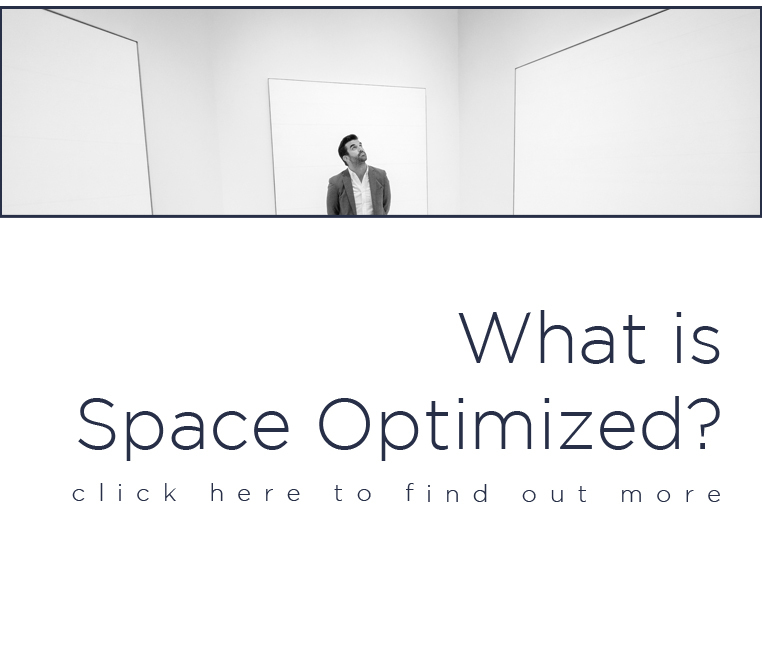 This can be done by picking a statement piece, such as a colorful carpet or a piece of furniture, matching it with a variety of finishing decors, and building from there. You can also mix and match different decors to see if the combo works. 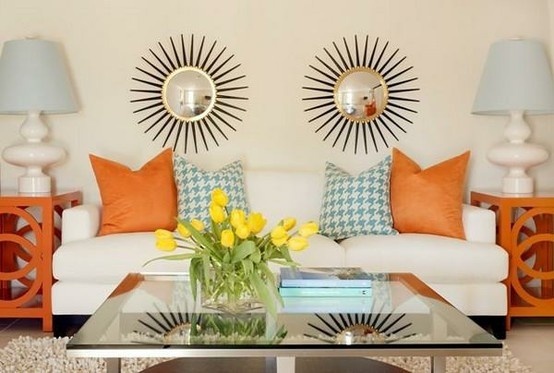 Mixing flowers with accent mirror, graphic textiles and artworks is a great way to start decorating in layers. If you love rustic accents, decorate awkward corners with woven baskets, wicker stools, and straw decors.